PHILIPSBURG - Governor Eugene Holiday cast his ballot early at his polling station - Hope Estate Senior Citizens Recreational Centre then started his inspection rounds of the other 19 polling station. Holiday was accompanied by Chief of Police Carl John. 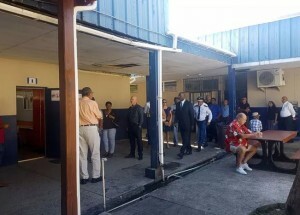 At each polling station, the officials greeted voters queued to cast their ballots. Inside the stations, they spoke with station personnel about the progress. Voting is going mostly smooth since the start at 8:00 am. However, the main hiccup has been a number of voters arriving to polling stations without their voting card. These are voters who did not receive their card at their home. Some 2,100 voting cards were returned to the Civil Registry as undeliverable by the Post Office. Voters who were told they had to go to the Civil Registry to get a replacement card were not happy with this news. A significant number did go to the registry which will remain open until 6:30 pm for voter services. This second snap election in 17 months was not welcomed by much of the electorate. Voters though have been heading out to polling stations. There is an indication of at least a 43 percent turnout based on the number of people who took time out to collect their cards in the first week of February. This was a new system put in place due to the severity of damage and voter displacement caused by Hurricane Irma. Usually, all voting cards are delivered by the Post Office. Six political parties are in today's race for the 15-seat Parliament.